Cooking with children teaches them independence, is great fun and helps them learn about healthy eating – provided of course that the recipes they cook are healthy ones! 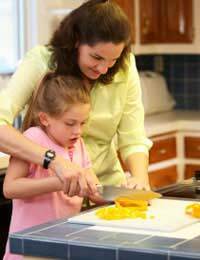 Good recipes for kids need to be simple to make, quick to cook so they don’t lose interest and delicious to eat. Most children like to start with their favourites, which tend to be cakes, biscuits and puddings. But once they’ve mastered the chocolate cornflake cakes and strawberry shortcake, try to move them on to foods that are more nutritious. This is not as hard as it sounds! Here are some suggestions to get the ball rolling. This looks gorgeous and is really easy to make. Just slice the three ingredients and arrange them in spirals round the plate – point out to the kids that this is an Italian dish and that the avocado, mozzarella and tomato look like the Italian flag … Then drizzle with dressing made with olive oil and white wine vinegar, garnish with chopped basil and serve with an Italian bread like ciabatta or focaccia. Kids can be a bit tricky about vegetables, but they’ll often be more enthusiastic if they’re dressed up in a cheese sauce. Cook the vegetables so they’re still a little crunchy, and put them in a flame-proof dish. Good ones to use include carrots, cauliflower, broccoli, peas and potatoes – but most vegetables work well with this recipe, so leave it to the kids to decide. Start the sauce with a flour and butter roux, then gradually add milk until it’s the right consistency. Add cheese at the end (and mustard if the children like it). Then pour over the vegetables and pop under the grill until the cheese bubbles. Most children love chips, but all that fat isn’t very good for them, so this is a delicious alternative. Cut baking potatoes into wedges, rinse and pat dry. Toss them in a bowl with olive oil, pepper and a little salt, then put them on a greased baking tray. Bake in a hot oven for about 40 minutes until the potatoes are soft in the middle and crisp and golden on the outside. Great with fish or meat and delicious as a snack with a salsa or sour cream dip (mix with some plain yoghurt and chives – it’s healthier and tastes delicious). Risotto is a really versatile dish that children will love adapting to include their favourite ingredients. Essentially, it’s rice cooked in stock until the grains have absorbed all the liquid, with vegetables like onions, garlic, leeks, peppers mushrooms and peas. Bacon, ham and tomato puree are great additions – and for special occasions, a dash of cream turns it into a dish fit for a king. The method is very simple. Sauté all the ingredients except the rice in olive oil until soft, add the rice and cook for another couple of minutes, then pour in a little stock. Add more gradually until no more liquid can be absorbed and the rice is tender. Garnish with plenty of fresh herbs. Nearly all children enjoy pizza, but some ready-made or takeaway versions are laden with fat and salt. Making their own is very simple and much healthier. The base can be anything from a shop-bought pizza base or home-made dough, to pitta bread, crumpets or even a slice of toast. Spread with a tomato topping – pasta sauce from a jar is fine (but watch out for salt) or try sieved/canned/fresh tomatoes whizzed up with some herbs. Children can add more or less anything they fancy after that. Chopped mushrooms, peppers, onions, leeks, asparagus, aubergines, spinach and globe artichokes are all good. Cooked and cured meats and tinned fish like tuna work well and an egg cracked on top of spinach and ricotta is very tasty. Acidic fruits like pineapple complement ham or bacon. Mozzarella is the traditional cheese for pizza, but just about any variety will do. Adventurous kids might like to try goat’s cheese. If vegetables are the type that need boiling, cook them lightly first. Some people prefer to sauté the onions, peppers etc too. If using crumpets, toast or similar, cook the topping first – then pile on the cheese and finish off under the grill. If using an authentic pizza base, the whole lot can go in the oven. Taco shells are a great vehicle for healthy fillings – and pitta bread or pancakes work just as well. The authentic Mexican Taco is packed with onions, garlic, tomatoes, kidney beans, mince and chilli. Red peppers, aubergines and courgettes are great additions; kids could also try chick peas to replace the beans and quorn mince or grated carrot to replace the meat. Then top with anything from sour cream or guacamole to shredded lettuce, grated cheese, chopped tomatoes or salsa.